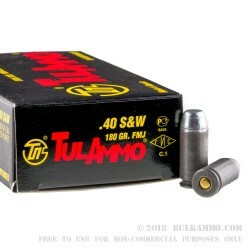 If you're looking for 40 S&W ammo that gives you a ton of range time for the money, Tula's 180 grain FMJ 40 cal rounds are a great choice. 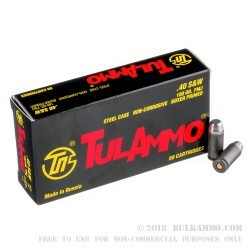 Russian made and cheap in price, this bulk ammo buy is the perfect solution for training time. 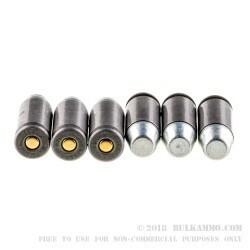 These rounds feature a standard 180-grain, full metal jacket bullet along with economical steel casings. While this ammunition is not ideal for reloaders, it is a fantastic choice if you're looking to take your pistol to the range and get some trigger time in. The reported muzzle velocity from Tula is 990 feet per second with this load. 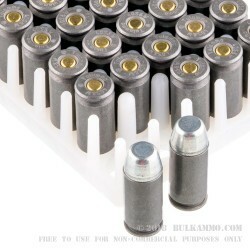 These rounds are packaged in boxes of 50 and in this bulk pack of 500 rounds, you'll receive 10 boxes ready to fire. Order today from BulkAmmo.com and you can expect fast shipping and the best customer service on the web. .40 S & W, 180 gr. Great price and fast, fast shipping. Bought three boxes of 50 round each ammo for both 40 cal and 9mm. No problems with the 40 cal until the 111 shot, which failed to extract the shell case from the chamber. Took awhile to pound the shell case from the gun (with assistance of the range officer), and then found the shell was covered with black sticky polymer. Very little powder residue from the firings. Just before my gun jammed, my son was firing his 9mm and had the similar problem, at shot # 42....weapon failed to extract the shell case.....also covered by black caked crude. You may save a few bucks buying steel cased ammo, but its my opinion that its not worth the aggravation. We'll shoot up what ammo we have left, by alternating between clips of brass and steel shots, and shoot slower with the steel rounds so the chamber won't get so warm (recommended by the range officer). Decent enough for range use.